Lavaloon Rage – Wanna Have Some Fun? Ever wanted to use a good deck if your only Legendary is Lava Hound or if you are an F2P player (or if you like Clash Royale comedy)? Then read this guide and use my LavaLoon deck! Some higher arena cards can be replaced with lower arena cards to ensure that you can use my deck! I made this 3.4 Elixir LavaLoon deck a while ago, and even after the “recent” balance changes, this deck still rocks, rolls, and kills all decks (except maybe Giant Double Prince and my Mega Hog)! Well, I’ll shut up and tell you how to play this deck now! Lava Hound: Come on, how can you use LavaLoon without a Lava Hound? Well, I have made an alternate version of this deck with Giant replacing Lava Hound, but it doesn’t work as well. The Hound is there to tank for the Balloon, and even after it dies, it spawns six Pups to deal a decent amount of damage. Balloon: LavaLoon without Loon? Where did your win condition go? Into my deck, of course. My Balloon is level 5 and doing almost 900 damage per hit! The bomb drops once it dies serves as a great Minion Horde killer if they are good at placing a Minion Horde! Rage: Once you Rage your Balloon, your opposing king might as well whip out a Rage spell to drink for himself! Yes, this is a LavaLoon Rage deck that can shred towers in an instant! For only 2 Elixir, you can make your Balloon 1.35 times as powerful as normal while also buffing your Lava Hound! This card is one of the three spells in this deck, and even though it is probably the least needed spell here, it still does quite a lot for the low cheap price of 2 Elixir! Guards: This trio of bony fighters is here to stop ground pushes from shredding your towers. It can also be put for a 10 Elixir combo of Guards Ballon Rage. This is your main Giant killer and your best way to stop Prince/Dark Prince. Use these wisely, as you don’t have many ways to stop ground troops. Ice Spirit: The balance changes didn’t do much to him. It didn’t change the Ice Spirit + Zap = dead Minions card interaction, and people don’t even care much about his damage. Taking away half a second of stun duration can’t stop me from using this 1 Elixir card! Minions: Yes, I chose 3 Minions over Minion Horde! I did this because I wanted a very fast cycle so that when you don’t have LavaLoon Rage combo in your hand, you can easily cycle back to it! 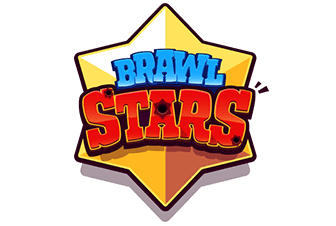 These three blue killers that shoot… ink sacs… well, they’re in this deck to easily kill Inferno Dragons, Balloons, air troops, etc. Zap: Okay, time to show you the final cards, the damage spells! Zap is a very versatile card that can be used in any deck archetype! It fits into the meta no matter what! Zap is in this deck to give an easy way to stun troops, as it’s more reliable than Ice Spirit at stunning, but lasts less time and costs more Elixir. Zap can easily stop a Giant swarm push, however, I recommend to max out your Zap as I did. It’s very fun to Zap away level 1 Princesses and level 11 Minion Hordes. I love Zapping away level 12 Gob Gangs as well. Fireball: Ah, the other spell that will always be the meta. One time I fireballed a Balloon during a battle before I created this deck and it hit the Balloon the FRAME before it would hit my tower! The bomb did do almost 300 damage to my tower, but my opponent raged crazy for a whole minute and a half after that! Okay, enough of my life story. Fireball is in this deck for Minion Hordes (high level) and as always, perfect at being anti-Orange Juice with them negative elixir trades on those Goblin Barrels! Fireball is in this deck for two reasons. The defense for the offense (kill Minions and Archers); Tower chipping when the tower is within range of two Fireballs or one. First things first: If you have Hound and Guards in your starting hand, wait until you’re at 10 Elixir and then you can play Lava Hound at the back. Guards are there in case your opponent attempts to punish you. This trick also works for Hound and Minions. The worst starting hand you can have is tied to all spells and Guards and all spells and Minions. One of the things I absolutely is Elixir leaking. Don’t Elixir leak with this deck as there is little defense. Try to do a LavaLoon Rage while keeping Fireball ready. If you find out they have Rocket, play Lava Hound in the general placement, one of the bottom corners, but place the Balloon so that your opponent cannot hit both the Balloon and the Lava Hound with one Rocket. Be sure to Rage the Ballon as well, because you just might be fighting Chief Pat on a secret account of his. Try to find out what deck they have and refer to my Matchups list to find out how to stop them. 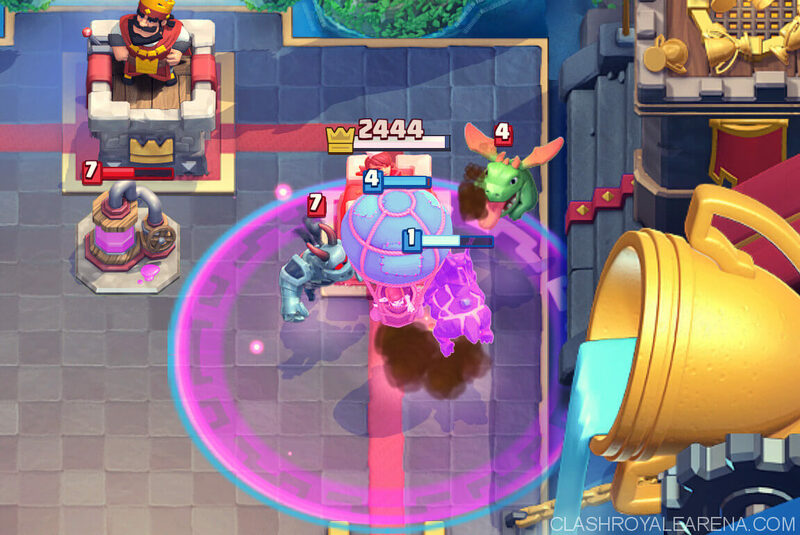 Try to cycle LavaLoon and not let them attack or set up a conterpush, as this will make it almost impossible to win at that point. Don’t be afraid to sacrifice a tower (unless your King sits on top of it) to bomb down their King’s Tower. Try to get a tower in the first two minutes, as this will make it so that they must defend their King Tower. If you are tied 1-1, go for the second tower, not the King. They will most likely aim for your King Tower, and that’s why you have Guards and Minions. If you are 0-0, just go for a single tower and then defend for life! If you are losing 0-1 or 1-2, take a tower, then defend. Wait for overtime to pounce again. If it’s 2-2, just go all or nothing on their King unless you have way less King HP than them. In that case, do a lone Raged Loon, and keep Guards, Minions, and Ice Spirit ready to defend. Giant Double Prince: Probably hardest matchup. Try LavaLoon cycle to keep them kneeling on the ice and not able to get up (if you understand that metaphor, my jokes, and my puns, your IQ is over 9000), as that way you don’t let them attack. Since this deck is Air-based, their Prince and Dark Prince can’t do anything against your Lava Hound and Balloon, and especially not the Rage (unless they think Freeze works well in Double Prince decks) spell. They will play their X-Bow at the bridge, which means it’s very easy for your Balloon to explode the long-range crossbow to pieces (apparently pieces that can sink under rocks). Other than that, watch out for their Tesla, and don’t give a crap about the Ice Golem, but give the Archers a ball made out of who-knows-what, but who cares since it’s on fire. Rage the Balloon, even though you know they will be using Ice Spirit. But remember that since this deck is mainly air, and X-Bow can’t target air, it still poses a threat. 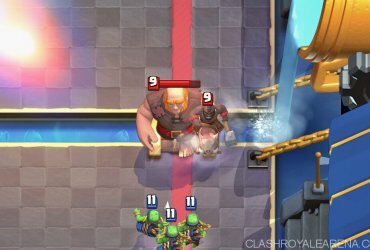 Golem Beatdown: Don’t Fireball their Pump. You already have fast cycle anyway. Save the Fireball for the support/Three Muskies. Cycle them to smithereens. Not much to say here. Spell Bait: You only have two spells, but you have Minions as well. Spell Bait dies to LavaLoon unless they use Minion Horde, but you still have Fireball. Try to use 1-2 LavaLoon Rage combos on them and finish them ASAP. Otherwise, they will swarm you dead. Bridge Spam: No buildings means you might have a problem. 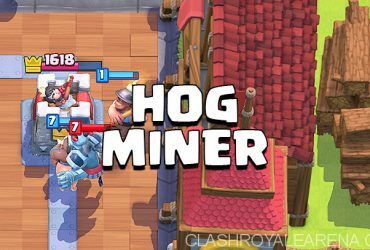 Battle Ram can take down a tower to half HP rather quickly, but don’t be worried. Guards + Ice Spirit shatters the wood and metal block along with shattering the Barbarians’ bones. 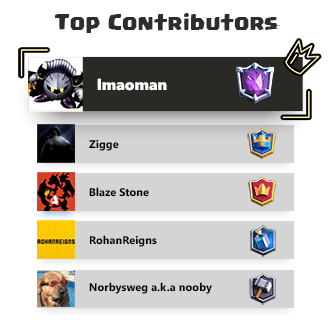 Just LavaLoon them but also send Minions with it this time as to stop Inferno Dragons. Hog Cycle: Ah, been waiting for this one. I saved the best two for last. Just counter the cycle card with your spells and LavaLoon them gone and helpless at the end! Ah, it’s fun to obliterate my friend with this LavaLoon Rage. In other words, make them helpless, ignore the Hog, and just go all in for the three crown! RG and EBs: Who cares? Well, I think I’m done with this guide. Comment down below on which one of my jokes you think was the most depressing. Jason’s Deck v2.0 – Giant Hog Beatdown Is Back!